Let’s face it ladies, we ask ourselves this question WAY more then the men. I will be the first to admit that 99% of the time I live in jeans and a t-shirt, it’s just easy and comfortable. But, there is that 1% of me that is all girl, likes to wear heels, get my nails/hair done and to be, “all done up” every now and then. So when it comes to picking out what to wear to the range, believe it or not there are some tips I can give you. 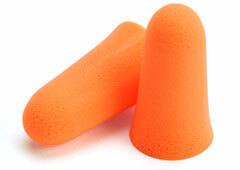 First, two things you are going to need to invest in are: hearing protection and safety glasses, aka “eyes and ears”. Now most ranges will provide these to you (free) with your range fee, but keep in mind that they are “public use equipment.” They will clean/disinfect them, but do you really want someone else’s ear sweat on your head if you don’t have to? These are also items that you can pick up fairly cheap. 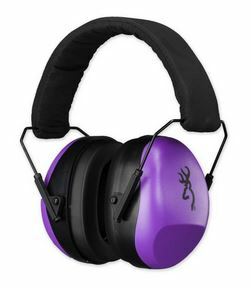 My personal favorite, and what I would recommend to you is what is called, “electronic hearing protection.” These offer more loud noise protection to your hearing then the foam plugs. And when you are shooting, they allow you to be able to still hear people talking, and when the noise reaches a certain decibel they will “remove” that noise from what you can hear. These come in all sorts of options, pink, grey, blue, leopard print, zebra print etc. I found this cute pair of purple ones online for $21.99. Electronic Hearing Protection Okay, now that you have your “eyes and ears” for the range let’s get back to the all important question: What am I going to wear? Let’s start from the bottom and work our way up. 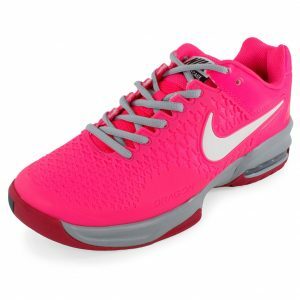 Your feet: You are going to want to wear shoes that COVER your feet, no flip flops, no sandals, no open toed shoes. You are just asking for a piece of hot brass (the spent casing coming from your gun, or your neighbors) to land on your foot/toes. This casing is HOT, I mean really HOT and it will burn you! 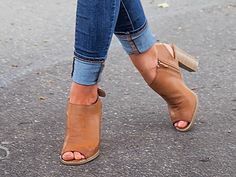 Keep in mind that the floor is also going to have empty casing, these could cause you to slip, lose your balance to just slide/roll underfoot, not he time to be in your favorite 3 inch heels. Personally I wear my tennis shoes, easy on/easy off and if I want to bring my “cute” shoes with my I can just as easily change in the car. Next, your legs, WEAR PANTS!!! I can’t tell you how many times I cringe when I see a lady at the range in shorts, or a short skirt, you are just asking to get burned. I understand that in the Summer not everyone lives in jeans like I do, but this is not the place to leave your legs exposed. I will even give you a “pass” on wearing Capri’s, but please don’t wear shorts! Lastly, you are going to want to make sure that the “girls” are protected. This means NO tank tops, low cut shirts or v-neck style shirts. You think a hot piece of bass hitting your foot/toe or leg is going to be bad; I can tell you from personal experience that hot brass down your shirt is MUCH, MUCH worse!! I was at an outdoor range, it was a beautiful Summer day, the sun was shining, I was shooting and life couldn’t get much better. But, I was in a tank top, (actually 2 of them, I like the layered look) not spaghetti straps and not over exposing the girls, just a run of the mill Target tank top. (the one pictured below) I was covered up, or so I thought. You see ladies, even if you are covered, when you put your hands together and drive them out in front of you (pretend your holding a gun), you are automatically pushing the girls together and creating a “valley” for things to fall into. And that is exactly what happened to me. I had already fired about 200 rounds that day, everything was going fine, until . . . .a piece of hot brass hit the side wall bouncing off and by some freak chance, landed right in that “valley.” Now I will be honest this whole situation only took about 2.5 seconds, but to me it was a life time. Here I am, loaded firearm in hand, and I can smell my own flesh burning. As fast as I could, I dropped the magazine out of my firearm, racked and locked back the slide, dropped my firearm on the range table and went to retrieve that hot piece of brass. But sadly, it was to late, I was burned and not just burned, I already had a blister!! Well, two to be exact, one on each of the “girls”. Needless to say this was the first and last time that I went to the range in a tank top. See why I love my t-shirts so much? Here is what you want. To be covered, plain and simple. Any exposed skin you leave will run the risk of being hit with hot brass. 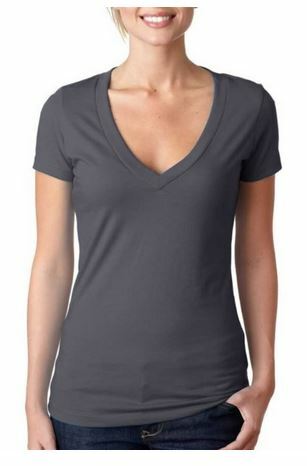 I know some of you are thinking to yourselves, “If she is in a t-shirt, her arms are exposed.” And you are right. I am taking that risk of being burned, but I can also quickly “shake off” brass on my arm, other places not so much! And hot brass hitting my arm is going to tend to bounce off me, minimizing the amount of heat that my body can absorb. 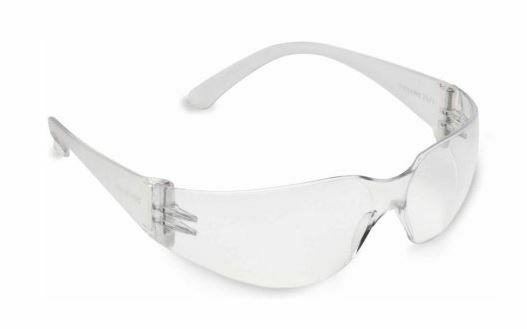 This may seems silly, but what you wear to the range can and does affect your safety. It is a natural reaction when you are in pain (hot brass/being burned) that you do what you can immediately to fix/remove that issue. The reality is that you have a LOADED firearm in your hand, this is NOT the time to forget the 4 universal safety rules. PS I will share a secret with you, all the guys at the range already think you’re hot in jeans and a t-shirt. Your a lady, you are at the range and you are shooting a gun. No man can resist!! Well today I would like to share some of those options with you, and some of my own personal pro’s and con’s on them. First one that I would like to start with you is the conceal and carry purse, (this is also know as “off body carry” as the firearm isn’t attached somehow to your person). I will admit when I took my own permit to carry course back in 2012, (before becoming an instructor) I WAS PSYCHED to carry this way! I LOVE handbags and purses and this was a great excuse to go buy a new one. In my class I asked my instructor, “what do you think of purse carry?” He looked at me and with a very serious look on his face says, “What are you going to do when they steal your purse?” I will admit in that moment I was totally defeated. That thought had never crossed my mind. Not only are they going to have my (super cool) carry purse, they also get my firearm, car keys and my driver’s license which has my home address on it. Bummer. I personally wouldn’t carry this way unless it was the only option I had for the day. 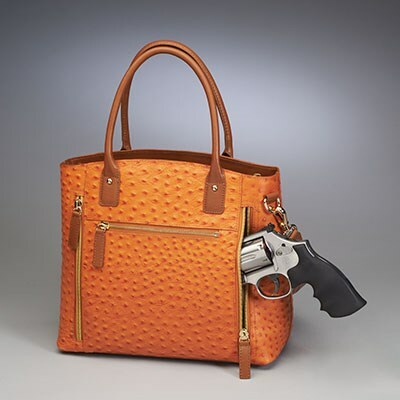 BUT, I am not against purse carry – if this is the only way I can get you to carry your firearm EVERYDAY then do it! A firearm that you leave at home is never going to protect you. I will also share a secret with you all, this is the only way I can get my Mom to carry everyday. So I do believe that it has it’s advantages. You will just need to be more mindful of where your purse is all the time!! Don’t leave it in the front of the shopping cart and then walk 5 ft away. Don’t set it on the floor at someone house when they have small children that might be able to get into it. Don’t leave it on the passenger seat of your vehicle when you are pumping gas with all the doors unlocked. 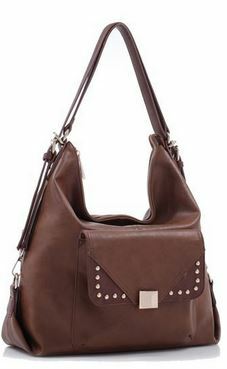 You will need to keep that purse on you (I would recommend a “cross body style”) all the times. 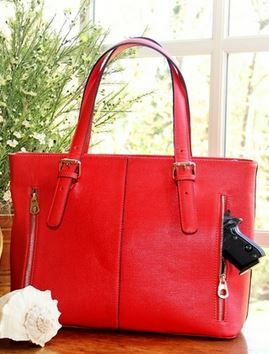 This website is amazing, they have everything that you could ever dream of: Hobo style, Cross body, Leather bags, in every shape, size and color you could imagine. Happy shopping, don’t say I didn’t warn you! 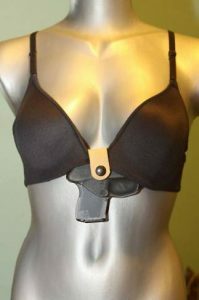 Next is the “Flash Bang Holster.” The gun world is trying ladies, they really are. They want to come up with a way to get you to carry, this one just wasn’t thought out very well. 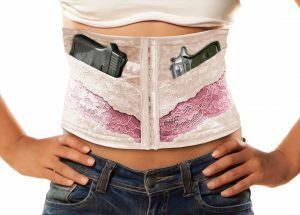 The Flash Bang Holster is meant to hold a small firearm, clipped to the center of your bra, and neatly tucked into one of the cups. Now when I think about carrying this way – universal gun safety rule #2 jumps to mind. “Never point the firearm at something you are not prepared to destroy.” I am NOT okay with having a firearm pointed at one of my “girls!” Sadly, there have also been a number of “accidental shootings” with this holster when women try to adjust it. Here is just one example for you. This holster might seem like a good idea, but in the big picture of firearms and safety this one gets a BIG thumbs down from me. Now here is one that I really like – leggings!!! I will tell you that I received a pair of these for Christmas in 2016 and they are not only comfortable, hold the firearm well in place, but they are made of good high quality material that helps “hold the rest of you in” too! Right now they only come in black, but do come in 3/4 or full length and also have a left or right hand options. I have carried with these leggings and had no issues. There is an elastic strap that will go over the grip of your firearm to hold it in place. I was able to run errands for the day (multiple times in and out of the SUV), went grocery shopping, and took the dog for a walk, all with my Glock 43 tucked neatly behind me. 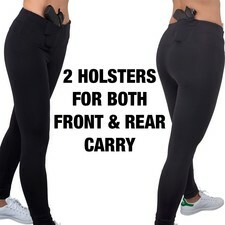 I will point out that I am not a fan of the “front holster pocket.” Again, with universal gun safety rule #2 – I don’t want my firearm in the front pocket, pointed at my Femoral Artery. If I were to have an accidental discharge of that firearm, that round is going right into that artery. So, when I wear these, the firearms is always in the rear/back holster. Which then leaves the front holster open for an extra magazine, my cell phone or anything else. I recommend these in my classes too! With the rise in popularity of the leggings/yoga pants among women it’s only going to be a matter of time until these come in other color options and styles. Here is another option for you – but one I want you to think about before you run out and buy. The “Girdle Holster.” These come in every size and color combo that you can think of, I have even seen ones that come in camo! While I think this holster has potential, it also has some draw backs. Carrying this way, you are (again) pointing that firearm at your Femoral Artery – not a good option. But with the multiple pockets, it will allow you to carry your firearm on one side, and an extra magazine on the other – that is a win! If you are giving this holster some serious thought, I recommend that you spin the whole thing around. This will then put your firearm on your back, still allowing you quick access, but having it pointed in a much safer direction! 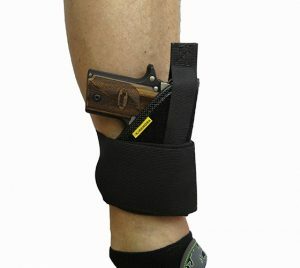 One last holster I want to share with you (and my personal favorite) is the ankle holster. Simple, effective and discrete! This holster is a win for me for a couple of reasons. In the summer (I usually never wear shorts) it allows me to wear jeans, and a tank top or other tight fitted style shirt, and no one is looking at my ankle to see if I am carrying! I am able to still be comfortable and not have a firearm hanging on my hip. This holster is made of Velcro – and it WILL hold the weight of your firearm – I carry my Glock 43 in this almost daily now that the weather is getting warmer. The Velcro allows you to adjust the angle at which it sits on your leg – leaning it a little forward or backward depending on what is comfortable for you. The large elastic band that wraps around your ankle is not scratchy, bulky, or uncomfortable to wear. It took me maybe 5 minutes at home to get the holster set the way I liked it, and to where it didn’t “print” under my jeans. Out the door I went – I even went shoe shopping (never taking the holster off) and no one was the wiser I was carrying ! They also threw in (at no cost to me) a free pair of safety classes and a free magazine holster (not to be worn on the ankle holster). But hey, who doesn’t like free gun stuff, I know I do! I will also give you a tip about this holster – when you order it will ask if you are right or left handed. (I am right handed). They will send you a right hand holster – but it is meant to be worn on the inside of your LEFT leg. This way, when you are carrying and need to gain access to your firearm, your left hand will pull up your pant leg, while the right hand is able to get a grip and draw the firearm with out any issues. The straps on the grip are also Velcro, when drawing the firearm they are easy to “break apart” to remove your firearm, yet strong enough to hold it in place. I hope that this little article gave you some good ideas and other options to carry. Just remember when looking for a new holster or a new way to carry think about: where or what the firearms is going to be pointed at? Are you able to draw that firearm quickly and safely from where you have it tucked? And how easy is it going to be for the “bad guy” to take my firearm if I should be involved in a physical fight with them?